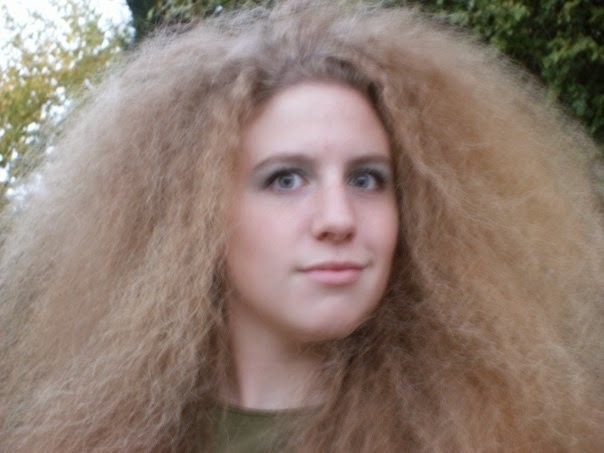 When I was in middle school, sometimes dumb kids would ask me if my frizzy hair was a result of me sticking my finger in an electrical outlet. Then I cried myself to sleep every night. Just kidding: usually I said something rude back to them. I was kind of a know-it-all, self-righteous, frizzy-haired pill in middle school and high school. I probably still am. But an open letter of apology to my former peers is the subject of another post ... this post is about an electrocution that actually happened. From my 2006 Halloween costume: dandelion. Scene: My kitchen. Our unsuspecting victim (me), a twenty-something mother dressed in a bathrobe floral sun dress and coordinating sky-blue, peep-toe pumps, dances from cupboard to cupboard, collecting ingredients for a highly-technical recipe: no-bake lemon cheesecake. She sets about combining the cream cheese, sugar, and lemon drink mix (real lemon zest? Ain't nobody got time for that) in her Empire Red Artisan Series 5-qt Kitchenaid Stand Mixer (buy a mixer from this link to contribute to my taco fund). After adjusting the mixing speed, she rests her arm against the top of the powerful piece of machinery, forearm grazing the metal attachment hub cover. 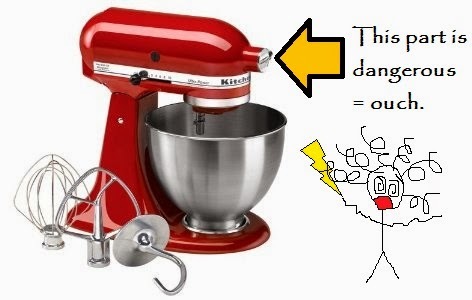 An annoying tingle zings up her arm, sending the message to her brain that the Kitchenaid mixer has evolved into a sentient being, and is, in a dark act of subversion, trying to kill her. She moves her arm, halting the rebellion, and finishes making her cheesecake (fold in some cool whip, pour into graham cracker crust, chill, and top with fresh berries). I don't care what anyone says; Papyrus is the font of champions. Odysseus used this font for his wedding invitations. I put up with these minor electric shocks for about a year. Then I googled it to see if this was normal ... apparently it's not (duh), and I read the story of another lady with an unruly, Milgram-esque Kitchenaid who had contacted customer service and gotten hers replaced. I chatted customer service, and when the lady on the other end (Susan) heard the issue, immediately requested to call me because Kitchenaid takes this issue very seriously. Susan called me, asked me a few questions about the serial number, my address, and whether I had been injured. Apparently they want to avoid having their products electrocute people, because Susan told me a replacement would be shipped to me right away, in the meantime I should stop using the mixer and unplug it (in case it spontaneously erupts into an electrical storm of fury over culinary slavery), and did I have any questions? I did have a scandalous question ... could I get a different color? Of course, Susan assured me. Oh my heck. Kitchenaid color decisions are usually made after years of yearning for the machine, planning out your dream kitchen colors, and finding the perfect hue that matches both your aura and patronus' favorite color! How was I to pick a new color in a mere moment? I scanned the options online with the panic of a baker forced to make a wedding cake at an unfamiliar altitude. Should I stick with Empire Red, making my mixer a charmingly bold statement piece on the counter? Though I do have dark green countertops that clash horribly ... What about the soothing Aqua Sky? The retro Pistachio? Sassy Green Apple? SUSAN IS WAITING. Cheerful Citrus Yellow? The classic Cobalt, the tradition of my father? SUSAN IS WAITING!!!! I am so mature and lame. Silver will not go out of style. Silver will go with any kitchen I ever have. Silver is the color my hair will be when this mixer finally dies and I can get a new color. I am a yo-yo of emotions over here, one minute full of crippling regret, the next confident I made the correct choice. MOSTLY REGRET. Validate my super-boring Kitchenaid color choice. Or make me jealous by telling me what color you have/would pick if your grandmother loved you enough (like mine) to get you one for your wedding. I don't even have a Kitchenaid, and I think about this all the time! Shopping at the grocery store (where Kitchenaids are not even available for purchase): "Maybe the blue. But the black is so classy. Don't they have a breast-cancer version in pink??" Someday.... someday. Didn't Bowman go for the Bosch? Pity they only offer it in white ... it's like they don't even care about their customers' hopes and dreams. I chose a nice almond color for my kitchenaid and I am so glad I have a neutral color! Who knows what colors my kitchen will be in ten years?! But I know my kitchenaid will fit right in. I think silver is a great choice. Pretty awesome that you are getting a new one! I looked the almond color up, and it's gorgeous! Like creamy gold! Now I'm wondering if that's what I should have chosen. I have the Cobalt Blue. BUT, only after I got the light yellow and hated it (too light). And then the darker yellow (too orange). I then went with the blue. You can't go wrong with classic colors. You can go wrong with Kitchen Aids that electrocute you. What do you do with the castaways? I wanted the Aqua Sky so bad, but half the pictures online showed it in a shade too bright for me, so I wasn't sure what I'd actually be getting. Shoot I had the same one in red and I painted it white last year. I'm all for the neutral, classic (never have to buy a new one...) look. How did you paint it?? This is revolutionary ... you could have a new color WHENEVER YOU WANTED. Tutorial, please. Colored kitchenaids are for people who don't pick up and move into completely new kitchens every few years. I can't see the future. I stick to neutral colors.